Your loss isn't so painful, because I see you everyday in the details. Thanks for painting my life with the most vibrant of all colors. You were in the middle of three books the day you died. You taught me to love literature, to adore the piano, and to be a life-long learner. Books and pianos remind me of you. 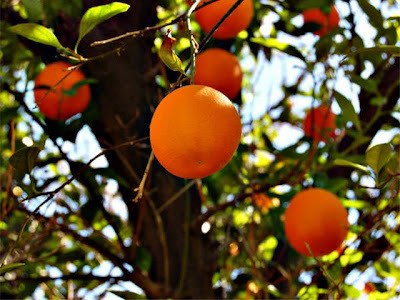 You had pomegranate trees and taught me that playing with me was more important that red stains on the carpet. Pomegranates remind me of you. You were down on your knees in prayer when you died. You taught me that the purpose of this life is to prepare to meet God. You taught me that death is but temporary while love and families are eternal. I know I will see you again. I am reminded of this everyday in the small and simple details you taught me to love. What a beautiful post about your grandma. What a beautiful post...makes me think of all the ways I remember and miss my grandmas. Oh, this is so beautiful. I am very close with my grandmother who is almost 90. She was just put in assisted living and we don't know how much longer she has. I can really relate to how you feel about your grandma. It's lovely what they teach us and what we keep in our memories of them. Thanks for reminding me of everything I learned from mine! Great post. I loved the pictures! 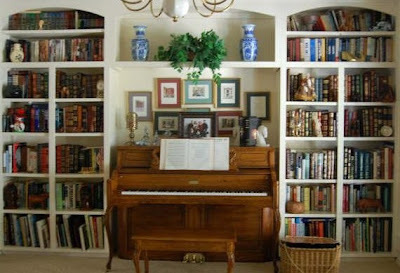 I REALLY love the bookshelves with the piano. Your letter was so sweet and touching. Very tender words and sweet pictures. She sounds like an amazing Grandma. this was a lovely post, and your Grandmother was obviously a wonderful person who was truly loved. This is beautiful! She sounds amazing and so spiritual! Simply beautiful. 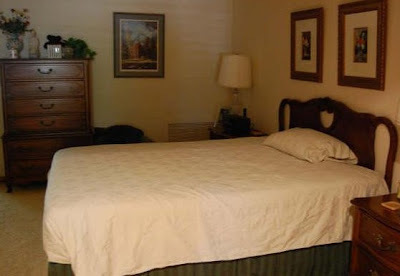 Isn't it amazing the most "common" of every day items bring our loved ones back to us? What a wonderful tribute to your grandma. She sounds like an amazing woman and friend. A perfect PSF Jyl! That was absolutely beautiful. 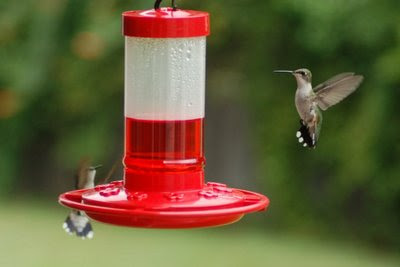 Hummingbirds remind me of my Grandma too! She had a feeder outside just about every window. I miss my grandma! Thanks for sharing this as it reminded me of sweet things in my life. Jyl-how Beautiful...just like you...in your words,in your pictures...Girlie you ooze LOVE! beautiful. my heart is full. thanks for that! That was such a sweet post. What a sweet post about your grandmother. It's so great that you can see her and be reminded of her everywhere. Wow. I've been following your posts for some time now, and you've hit yet another one out of the park. Your writing is sensitive, revealing, and thought provoking. I love the humor, introspection, and honesty. Thanks once again for brightening my day. Very well done. A great tribute to the positive things of life. Beautiful tribute. 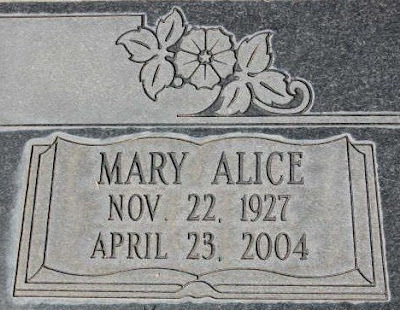 Mary Alice was such a great lady...so fun to be around, and entertaining to talk to. I loved her laughter. She really should just still be a phone call away. I still miss Grandmommy Trella to this day, but the loss does lessen over the years(it will be 20 years since she died in January). Just as the pain of losing my dad has lessened in the 3 years since it happened. I think the hardest part for me in losing Aunt MAS was the realization that her generation was starting to leave us. Her departure was much too early and quick, but knowing that that those she left behind (her sisters...my mother!) would be the next ones to eventually exit is still hard to wrap my head around, even after my dad died! awwww sweet. Glad you waited till the post 'jelled' or is it 'gelled'? Do you even get me? What a tender post. I love it. This was SO lovely, your Grandma sounds wonderful and would be SO PROUD!! Jyl, that was a beautiful post!!! I love it!! Describes your grandma perfectly. Her passing was a shock to all of us. She was an amazing lady and is sorely missed. This is very touching. I was close to my grandma too so I know how you feel. Seeing her in everyday things makes the loss ache a little less. Thanks for a great post! Jyl, this is a beautiful tribute. How lucky she was to share so many fun times with you. I haven't read the 42 comments ahead of mine, and I'm sure they say just what I'm going to say -- That was very touching. Grandmothers are something very special. I miss mine. That is a lovely post about your grandma! So special! Oh... what a wonderful grandmother she must have been. Grandmothers are just such special people, aren't they? Thanks for posting that; it reminds me of mine that I didn't get to spend so much time with. Your Grandma sounds like a beautiful lady. Thanks for sharing this. Indeed...love is in the details. This was beautiful...and brilliantly written. What a great tribute to your grandma. I love it! This was such a touching and heartfelt post - your grandma would be proud. What a lovely post. That will be a treasure for your children someday. Your Grandma sounds like a wonderful woman. What a beautiful post and a sweet tribute. My grandma also had pomegranite bushes in her back yard, they always remind me of her. What a beautiful post about your grandmother. She sounds like a very special person. A beautiful post -- your grandmother sounds like she was an absolutely amazing woman. And, thank you for your guest post last week. I owe you! oh man - this post brought tears to my eyes. Look -that's two comments in two days WITH word verification. btw - it's an easy one today: vvojl or maybe wojl? This is so beautiful and sweet and very MAS, but I defy you to try to put into words her fun and vibrant personality! She is such a unique character that it would be hard to really describe her. Very funny-- yet smart and witty-- lady. Sorely missed! Such an incredibly beautiful tribute to your Grandma. It's amazing just HOW MUCH LOVE grandmas pour into their grandbabies. I'm similarly appreciative of my own grandma... Thanks for reminding me how special she is! Hey Jyl- that was a nice tribute to your Grandma Smith- now I'd like to see one opn Grandma Deenie- hee hee! Also, is it OK with you to add your blog to the MHS Class blog? Just think- more opportunities for you to receive comments- I know you love them so! Awe. BEautiful post. I am loving your library. What a nice tribute. It's awful losing a loved one. I miss my grandparents every day! I lost my grandmother at 101 and, although she lived such a full life, I can feel SELFISH at times as *I* wasnt ready for her to go. I need to step back more often and view life through your loveinthedetails lens. What a wonderful tribute and love the pictures. Thanks for introducing yourself to me. Nice to meet you. What a beautiful post. A lovely tribute to your grandmother. It's good to remember...to keep those important reminder fresh. You have some amazing memories to hold dear. I miss my grandmother too and at odd times. Nice post! Aww... my grandma loved hummingbirds. That first picture totally reminded me of her! That was very touching. Makes me really miss my grandma. Thanks a lot! Aaack, you've got me teary-eyed! Grandparents are so important to me, as someone who lost all of hers by the time I was 18. I had a Noni, a Pop, a Grandma and a Grampa. I was my Grandma's "special medicine" and even though I was only 9 when I lost her, I have the most vivid and wonderful memories of her. Smell really is a powerful sense, whenevr I smell coffee or rose sachet, I see her in my mind.Grandparents are such special people. This post is beautiful, so touching and poignant.